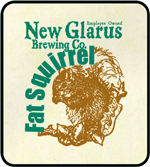 One deceptively spring like winter day, Brewmaster Dan walked home from the brewery, sat down to dinner and said, "Boy, there are some fat squirrels out there. They're running all over the place. I think I should brew a Fat Squirrel Nut Brown Ale." Deb agreed and so another beer legend was born. 100% Wisconsin malt of six different varieties impart the natural toasted color to this bottle conditioned unfiltered ale. Clean hazelnut notes result from these carefully chosen barley malts. Hops from Slovenia, Bavaria and the Pacific Northwest give Fat Squirrel its backbone. When the going gets tough, remember to relax a moment and enjoy the "Fat Squirrel" in your neighborhood.